Jason developed quite an eye for antiques during these trips with his mother, and helped her pick out a number of pieces that they still have today. One of them was this cabinet, which he originally picked out for his own room. 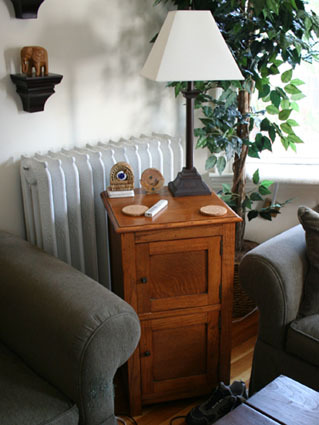 Later, it became an end table in his parents' family room. When they recently embarked on some renovations and found that the cabinet needed a new home, his mom and dad gave us first dibs. Items to be used for storage should not be open. Whether it's a door or a lid, always make sure that you can hide your inevitable disorganization inside from the world outside. Beware the law of gas. This law states that gas will expand evenly to fill any space. Getting a bigger closet, for example, will lead to acquiring more clothes to fill it up. I don't think I need to explain how this relates to yarn, hmmm? In other words, my basket was unsightly and too big for my needs. Out it goes! The cabinet is perfectly suited to hold between four and six projects worth of yarn, as well as my needles, notions and a few books. The metal baskets are my addition, they make it easier to see what's in the cabinet and save me from having to pull everything out to find something buried in the back. What's the white yarn, you ask? What am I working on now? Patience, my pretties, patience. 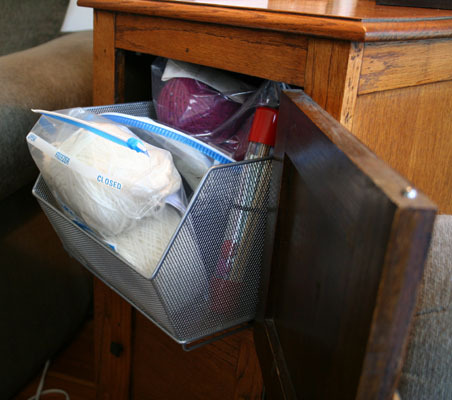 Looks like a great idea for storage. So what's the white yarn . . .?